I have long been a fan of David Whiting and Red Newt Cellars. I remember meeting him a the first year he was at Finger Lakes Wine Festival the first year Red Newt went into business. I have been a fan ever since. This past July I went with Bryan Van Deusen and Rich Srsich, as usual. We stop there almost every year. I look forward to stopping there every year. I've always liked the tastingroom. It's airy, and roomy, and beautifully appointed. We settled in for our tasting. The first wine I tried was the Dry Riesling Reserve 2010. It was lovely. Green apple and citrus come across almost immediately. Followed by other tropical fruits. A tremendous fruitiness covers the palate, never sweet, and then a big pop of citrus finishes the taste. Incredible, sophisticated, elegant. An amazing wine. Gewurztraminer 2007 Dry Sawmill Creek was a aromatic dry light white. Perfume-y, delicate, elegant. Absolutely one of the best Gewurztraminers I ever tasted. Fabulous! Pinot Noir 2011 This is a lovely, light bodied dry red, with big whiffs of bright cherry and nice follow up of vanilla. A lovely wine. Cabernet Franc Glacier Ridge 2011 was, as always, one of the Cabernet Francs on the east coast. Impressive. Big, dark, deep fruit, cherry, raspberry, plum, and hints of cassis. A nice mellow middle, and a lovely finish with moderate tannins. Gorgeous. Incredibly well balanced. Viridescens 2011 is a blend of 56% Merlot, 29% Cabernet Franc, and 15% Cabernet Sauvignon. Dark cherry, blackberry, and cassis are the big fruit up front. Nice middle and then a well balanced dose of tannins. Complex and elegant. As lovely a Meritage as you will find on the east coast. Hellbender Port is an impressive mixture of Noiret, Cabernet Sauvignon, Cabernet Franc, and Merlot. A lovely, deep, impressive wine, with gorgeous fruit and sweetness, that is mitigated by the tannins provided by the Cab Sav and the Merlot. Again, very impressive. I have never been disappointed by a visit to Red Newt. And neither will you be. I tasted Wolf Hollow when I went to a festival in May. I was immediately impressed by the three tastes I had! I was blown away! Alright, all you have to do is read this statement on the website, and you know why I like these guys: "In an effort to bring the “micro” back to micro-brew, WHBC will focus on crafting beer and relationships. We believe that there is great value in the power of good beer to bring people together and that the more we grow as a community, the more good things might come from the building up of those relationships. To this end, WHBC will be a hub around which our small town of West Glenville might become even more connected. WHBC is not designed to be the next Sam Adams, but instead to stay true to the community from which it springs and to always do its best to provide its local residents, friends, and neighbors with world-class quality beer that they can truly call their own. We like to say that we have a BIG vision, operating on a SMALL scale. We wanted to concentrate on perfecting the craft and focus on our product and our customers in a responsible way." Wolf Hollow Amber is an American Amber Ale of 5% ABV. This is the Wolf Hollow Amber is the flagship beer of WHBC because it is crafted after the unique character of West Glenville. The toasted notes and the warm reddish hue lure you in, and then the dry-hop keeps this beer honest. A very easy drinking beer. District 6 IPA is an American India Pale Ale with a 6.7% ABV. According to Wolf Hollow, "The local firefighters of District 6 in West Glenville work hard for their community and they deserve a beer that reflects the intensity and clarity of that work." 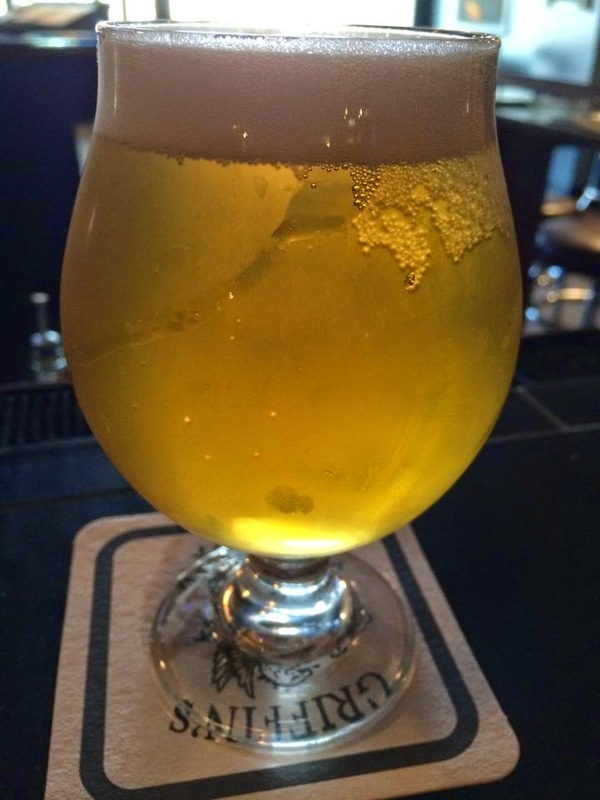 This is a pale yellow India Pale Ale is dry-hopped, so it has a big, floral nose. Absolutely beautiful! And a nice bitter finish. Great beer! Pulpit Supply Brown is a lovely drinking 5.2%ABV American Brown Ale. A beautiful maltiness greats the nose, but it also has a lovely hoppiness at the finish. According to Wolf Hollow, "The Nugget hop used provides subtle florals reminiscent of the District 6. 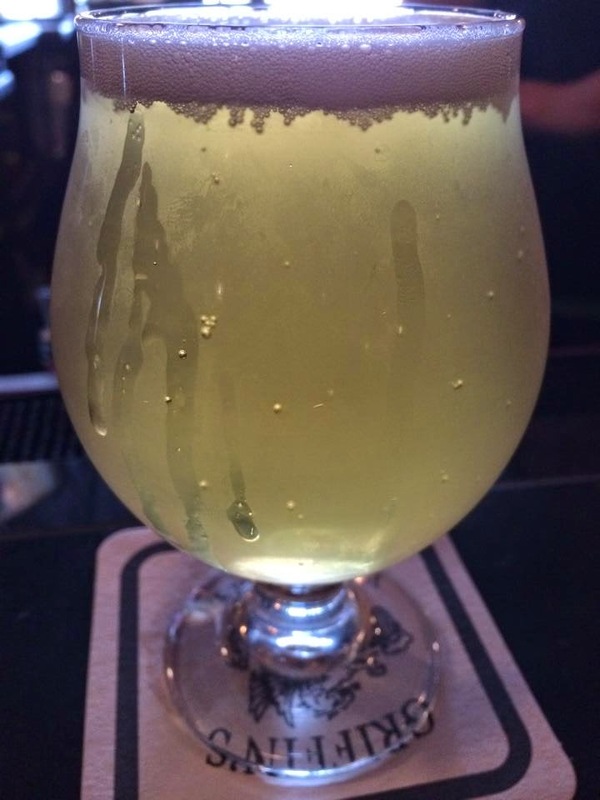 When Wolf Hollow’s Brewmaster made a decision to “put off” seminary in favor of brew school, one of his colleagues famously responded, “Lord knows, preachers need beer too.”" This is a great beer! Three quick tastes were all I needed to make the decision on this brewery. And then I had a couple long pulls. And I was thrilled. And you will be too! So this last summer, there was a small wine and beers fest at The Beer Diviner. You didn't have to pull my arm to get me to go. The beer diviner is a funky place. Dr. Jonathan Post, a former English professor (you know I like him already) traveled to Africa and mad beer. As Jonathan tells it, "Back in 2002, I was invited to brew beer by the elders of the Dagara village of Dano in Burkina Faso, West Africa. Dano means "Good Beer" in Dagara. While sharing my first batch with the elders, I was asked to build a small brewery. On a second trip the shamans divined that I was to do beer divination. I asked what beer divinination was. "We don't know," they said, "there has never been a beer diviner in Dagaraland. In fact there has never been a man who made beer."" And there the story begins. A trip to The Beer Diviner is never boring. There is always something unusual. For example he sells hand made African drums in his tasting room. One of my sons, a drummer, was most, most impressed. And of course he carries some other products made in the region, like Lake George Distilling, and several other brands from other folks. The tastingroom at The Beer Diviner is quirky. I love the chalkboard wall, and the rustic shelving, and the good selection. And if there's a spot at the bar, you are in luck. Also love the fired-up wood stove in winter. Very fun! No question, Got Your Back is among my favorite beers at The Beer Diviner. This is an Imperial Coffee Oatmeal Stout, cold brewed with Sumatra French decaf, Maris Otter floor malted Scottish malt and seven other malts, English Fuggles and Goldings hops. It's big and bold and dark and chewy, but with just enough hops too finish dry and refreshing. A tremendous beer. The Divinator is a Double IPA styled beer. Big and amber, with lots of malt, it nonetheless has plenty of hops to keep the ending on the beer honest. If you are expecting a hop-monster of a beer this isn't it. It's big and malty. But there is enough hops to keep it clean. And this is not a small beer. It comes in at a whopping 11% alcohol! Not for the feint of heart. A big beer! He also sells The Great Chocolate Wreck from Good Natured Brewing. That will be a separate review! Good stuff. So, after sever tastes form the tap, I settled into a Got Your Back, and enjoyed the afternoon. And before I left I bought a few beers. Fantastic!! So much fun!!!! A great time. Went to Vermont with the family, but of course had to turn it into a research trip as much as possible. One has to take advantage of his opportunities. I brought two books before we left. I wanted to be able to make informed decisions. That, and I love local beer books. The fir book I bought was the FarmPlate Vermont Beer Book by Kim Warner. It's part of the FarmPlate series. As We all know, Vermont brewers are emerging as some of the most innovative and entrepreneurial crafters on the American beer scene. craft breweries, restos and markets; a calendar of annual beer events; a preview of On Tap Soon breweries set to open in 2014; and a resource for local homebrewing supplies, hops and grains, etc. I found it a tad confusing at first, but once you get the hang of it (the maps in the back are keyed to the pages the beers and stores are written about on - fantastic), it's absolutely wonderful. If you are in a town and can reference the maps, you are very happy, and I was. A handy, useful guide. The second book was Vermont Beer by Ken Staudter and Adam Krakowski. This is a history of craft brewing in the Green Mountain State for more than twenty years. Early Vermont brewers, though, faced many obstacles in bringing their beer to the thirsty masses, including a state-imposed prohibition beginning in 1852. Conditions remained unfavorable until Greg Noonan championed brewing legislation that opened the door for breweries and brewpubs in the 1980s. About the same time, beloved Catamount also began brewing, and Vermont's craft beer scene exploded. Years ahead of the rest of the country, local favorites like Hill Farmstead, Long Trail and Rock Art Brewing have provided world-class beers to grateful patrons. From small upstarts to well-recognized national brands like Magic Hat and Harpoon, Vermont boasts more breweries per capita than any other state in the country. Includes brewer interviews and historic recipes. I found this highly informative and very enjoyable reading. A great book. 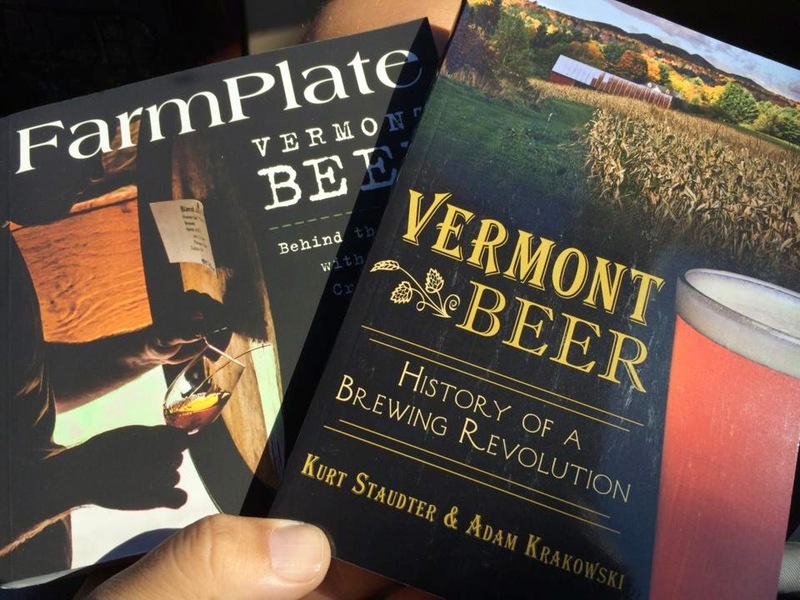 Both these books are the ultimate gifts for Vermont beer lovers. We were headed to Killington, Vermont, so that predetermined some of our choices. First stop was Long Trail Brewing. A well-oiled machine of a brewery and restaurant/brew-pub. We ordered two different samples and tried a sip of each. The Imperial Pumpkin was better than I thought it was. Several IPAs were very nice. And I liked the 25th Anniversary stout the best!!! 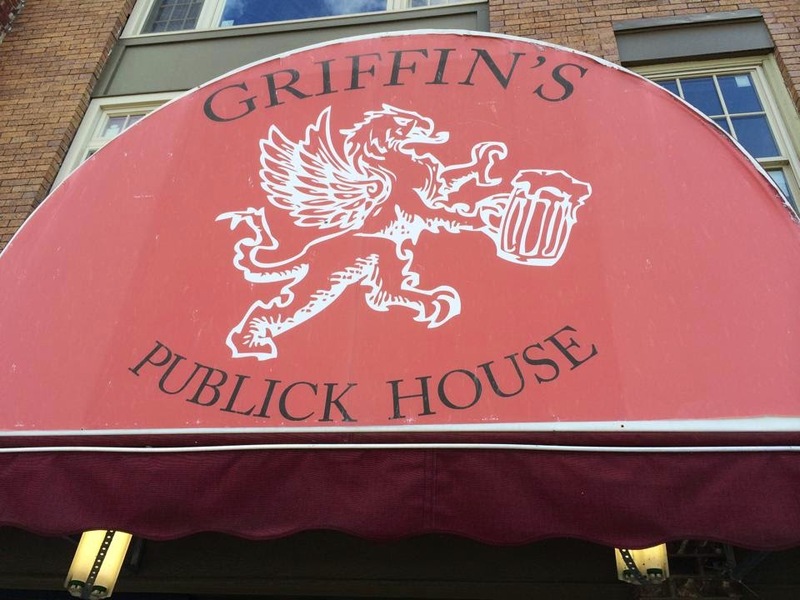 Then we arrived in Rutland and we visited the Griffon Publik House. A nice menu of local craft beers were available on tap, and the bartender knew her stuff when talking about craft brews. First I had the Drop In Wit beer. Drop In is a craft brewer from Middlebury, VT of very good reputation. A lovely drinking beer. Easy to drink. Nice flavor Fantastic! Zero Gravity was another of the two beers I had. Another fantastic medium bodied beer. Lots of flavor. Really nice. Lots more to report, but a fun adventure!!!! Hudson Valley Distillers are two couples who have banded together to create a unique distillery here in the Hudson Valley. Earlier in the year, sometime in June, they opened the doors to their tasting room in a Grand Opening. As you can plainly see, I would never make it in the newspaper business. The tastingroom and distillery are located in an old renovated barn. They are making heir applejack from locally grown apples. They are the kinda folks that are growing their own botanicals for their gin in a hot house there on the property. Doesn't that kinda say everything right there? Anyway, the Grand Opening was a huge event. And an incredibly successful one! Now, as much fun as this was, there is actually some news here, lest I am just publishing photos four months after the place has already been doing business. An that is about their Chancellor's Hardscrabble Applejack. Now, you might ask, what the big deal is? We've had applejack a while. But what's different about this applejack is that it tastes like whiskey! Chancellor Robert Livingston was an author of the Declaration of Independence, an entrepreneur that brought the steam ship to the Hudson River Valley, and the man that administered the oath of office to George Washington. He also once owned the land that we now call Spirits Grove Farm. During the Chancellor’s time, the town of Red Hook was known as Hardscrabble and was a crossroad on the main road between Albany and New York City. We like to think weary travelers may have stopped there and enjoyed Applejack similar to ours. Strong American oak start, hints of caramel and vanilla, ends like an aged scotch. This is a big, dry, oaky, toasty, nutty, vanilla and spice-y, warm applejack that really does taste like whiskey. If you didn't know it was applejack, you wouldn't know it was applejack. In the tasting room there were a number of amazed disbelievers who suddenly did a double take. I was one of them with a sore neck, I turned so hard. It was amazing!!! On the barn wall, they posted before pictures of the construction in the barn. Anyone who has ever done barn renovation will laugh and nod their head. Others will be powerfully amazed - as they should be. These two couples busted their butts turning this place over, and they have done an amazing job!!!! Go to Hudson Valley Distillers and see what they have built! It's incredible what they have wrought. And try the Hardscrabble Applejack - it is also incredible. And you will be impressed, as we all were, at what these folks have wrought.